For more than a decade, Chelsea Opera has been producing both familiar and little known operas, developing a reputation for high musical standards and consistent musical integrity. Chelsea Opera’s June 2015 Tosca continued this tradition. St. Peter’s Episcopal Church in Chelsea was used to near perfect effect as the setting for all three acts of the opera. Tosca’s first act, which does, in fact take place in a church was, precisely because of the narrative, “easy” to stage, but the successful transformation of the St. Peter’s Chelsea chancel into first, the emotional claustrophobia of the villainous chief of police’s quarters and then, for the last act, the open air witness to revenge and tragedy resulted from the imaginative, effective stage direction and set management of Chelsea Opera’s co-founders Leonarda Priore and Lynne Hayden-Findlay. Samuel McCoy, music director and principal conductor, maintained masterful control of the orchestra. The musicians were placed between the altar and the chancel, thereby requiring McCoy to conduct with his back to the singers. In spite of this difficult placement, McCoy successfully and skillfully retained complex balances and rhythmic patterns as well as dramatic timing of sung entrances, even in passages in which off-stage singers, on-stage singers and the orchestra were all performing. The twenty-three member orchestra played marvelously, filling the intimate church space so as to make it seem huge. Bigness – robust, satisfyingly large sturdiness – was, in fact, one of the core features of this Tosca. All the singers – especially the three principals – had very big voices, capable of reaching well beyond the farthest-away audience members in much larger concert halls and opera houses than St. Peter’s Chelsea. The sheer size of the musical sound – combined with the consistent excellence of both production details and “minor” characters’ and choral singing – gave this Tosca the feel of a major opera house performance rather than the offering of a small regional company. An additional important strength of this Tosca lay in the fine acting of the three principals: more than many operas, Tosca falls apart if the relationships among the actress Tosca, her lover, painter Mario Cavaradossi, and the Baron Scarpia, the sadistically self-interested and ruthless police chief, are not delineated with psychological consistency and credibility. Regina Grimaldi played Tosca as a worldly woman, an accomplished stage actress who has experienced the adoration of many men. Two purities burn inside Tosca: her passionate love of Mario Cavaradossi and her devotion to her art. Tosca’s uncontrollable jealousy debases her; her humble service to artistic beauty elevates her. Grimaldi’s Tosca was a woman of deep contradictions and ultimate dedication to love and art. 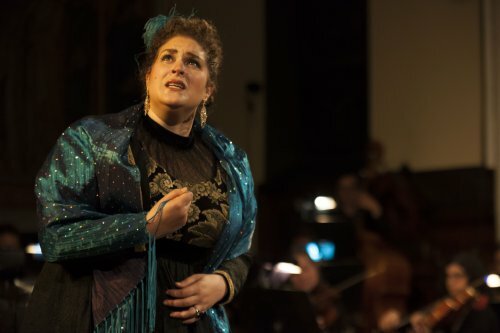 Grimaldi’s voice is earthy, sultry and bracingly intense: as a singer, she does not hold back at all, stretching her voice to its dramatic limits, and making her passions entirely intelligible to her audience. Though Grimaldi is not a delicate singer, her “Vissi d’arte” was successful because she sang it as an intimate prayer; the action-interrupting applause that followed the aria was well deserved. Edgar Jaramillo played Mario Cavaradossi as an idealist, a man as devoted to his art as Tosca is to hers, a political activist of yearning for justice and loyalty to his comrades, and a lover whose adoration of his beloved is so profound, so tolerant and so joy-filled as to make him almost naive. Whether because of his own actual youth or as a result of conscious interpretation decisions, Jaramillo’s Mario was more psychologically young and untried than either Tosca or Scarpia. His singing was ardent and passionate, whether responding to the emotional and sexual pleasure of being close to his beloved or terrible torture at the command of Baron Scarpia. Baron Scarpia, sung by Thomas Woodman, was entirely compelling and credible as the police chief whose habit of cruel and ruthless power has shaped his daily life for decades. Scarpia experiences his obsessive lust for the singer Floria Tosca as not merely a sexual frustration but also a maddening threat to his grip of political and personal power. The notion that he may not get what he wants – neither Mario’s breaking under torture nor Tosca’s acquiescence to his sexual aggression, both extreme physical manifestations of his unbridled desires – summons up cruel rage within him: thwarting of his wishes, for this Scarpia, is simply unintelligible. Woodman is a marvelous artist: acting and singing are of a piece. At the end of Act I, singing about his desire for Tosca while children and clergy sing about their desire for God, Woodman was sinister, powerful and fascinating. Describing Tosca, he lavished on the word “precioza” a full universe of meaning from lascivious perversity to domineering possession to cold-blooded calculations of sexual price. Other singers were successful, too, in both their musical expression and their acting. The sacristan (Luis Alvarado) was vigorous in his guardianship over the church and benignly tolerant of the full array of human foibles on constant display in its sanctuary; Angelotti (Brace Negron) was an intense political revolutionary, keenly aware of both political ideals and present danger. Spoleta (Hugh Vera) embodied effectively the complacent obsequiousness of the mid-level confidant to a local tyrant. The Shepherd Boy (Erich Schuett) conveyed both innocence and the promise of gentle strength in adulthood, epitomizing the enduring loveliness and order of pastoral life and singing with charming, unaffected confidence. Altogether, this Tosca was wonderful. The audience – most of them fairly familiar with the opera – was appropriately and happily appreciative. Chelsea Opera has created for itself an important place in the culture life of New York City: its maintenance of both high musical standards and consistent artistic integrity prove the merit of its continued support by loyal individuals and a wide variety of foundations and government agencies. 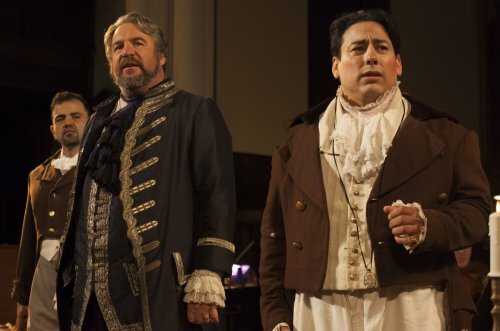 Productions such as Tosca are proof that Chelsea Opera’s accumulated fine reputation over the last decade is well deserved and that its future should be secure.